The far-right wingnuts and followers of Mein Trumpf are officially declaring war on “liberal” political enemies. Spoiler Alert; the right-wing is also heavily armed and have been practicing for this since the day of cold-war bomb shelters. 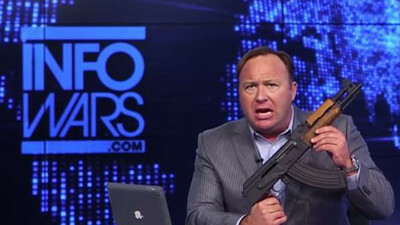 “In his radio show, on YouTube and on his Infowars website, Jones—who never met a conspiracy theory he didn’t like and who has pushed the notion that Sandy Hook was faked—has been announcing that the United States is on the verge of a bloody second civil war. Like the radio DJs in Rwanda, Jones has been egging on his conservative listeners and viewers—an estimated 2.7 million people monthly—to kill more liberal fellow citizens over their political differences. With that said, I feel it important to mention a conversation I had with a man last week. He said his son had been a Secret Service agent who had recently left the service, took a pay cut and became a fireman. “He saw the writing on the wall and got out before the election”. Me: Well what does he think about Trump? Me: Like the storm troopers in Germany? The S.A.? “Absolutely, and I’m worried about it too”. In that article we quote from Heather Digby Parton’s article about the NRA; “Could the NRA’s Wayne LaPierre Talk Trump into a Violent War on the Left? He became concerned when a thread at the non-political firearms-enthusiasts website he regularly follows became filled with comments in all caps referring to liberals as enemies who must be shot. This is going to be one long, hot summer. If Trump gets threatened with impeachment, it’s within the realm of possibility that he would harness the power of the armed right-wing to do his bidding in the streets. After all, they’ve been practicing for this for several decades. This entry was posted on July 23, 2017 at 6:42 pm and is filed under Nazis, Tell the truth and run !. You can follow any responses to this entry through the RSS 2.0 feed.